Ferns are beloved for their attractive foliage and are popular houseplants due to their tolerance of low-light conditions. Although many ferns are tropical and suitable for indoor growing in most climatic regions, some hardy ferns can tolerate cold winter weather and grow outdoors. Most ferns in general are low maintenance, but their care requirements are slightly different depending on whether you’re growing indoor ferns or outdoor hardy varieties. Ferns are typically slow-growing and shade-loving, requiring steady moisture and little fertilization. Water your outdoor-grown ferns. Provide about 1 inch of water, unless rainfall is adequate to provide this amount. Water ferns deeply and thoroughly once each week while they’re actively growing, which is typically from spring until autumn. Feed your outdoor ferns. Once each year in spring after new growth begins, apply a slow-release 14-14-14 NPK formula or complete organic fertilizer, according to the dosage instructions on the label. Spread a 2-to-3-inch-thick layer of organic mulch on the ground around the ferns. Do this every spring and again in the fall. The mulch will help to retain soil moisture and keep the soil cool for the ferns. Divide your ferns. When the center of the ferns' clumps begin to look dead or hollow, usually once every three to five years, dig them up, divide them and replant the fern clumps immediately after the first frost in fall, but don’t fertilize the transplants until the following spring. Place your indoor ferns in moderate, indirect light, such as beside a north-facing window that doesn’t receive any direct sunlight. Maintain air temperatures around your indoor ferns of 60 to 70 degrees F during the daytime and 50 to 60 degrees at night. Water your indoor ferns according to their specific requirements. For example, maidenhair, staghorn and bird's nest ferns prefer frequent watering for constantly moist soil, while the holly and squirrel’s foot ferns like slightly drier conditions with barely moistened soil. Mist your ferns. Every two to three days when humidity levels in your house are low, typically during winter, mist your ferns with water. Ferns with more delicate foliage typically require higher humidity levels than those with leathery foliage. Feed your ferns. Once every month from April until September, feed your ferns with a liquid houseplant fertilizer at half the normal dosage rate. Stop fertilizing the ferns during winter. Repot your ferns. When ferns become overcrowded in their containers, repot them in early spring, dividing them or transferring them into a larger container. Pot the ferns in an organic potting mix or in a mixture of one part houseplant potting mix and one part peat moss. Fine-leafed ferns may need double-potting to hold in more moisture. You can double-pot the thin-leafed fern by inserting the container into a slightly larger second pot that's lined with damp sphagnum peat moss. Don't let any kind of fern dry out completely or allow it to sit in water. 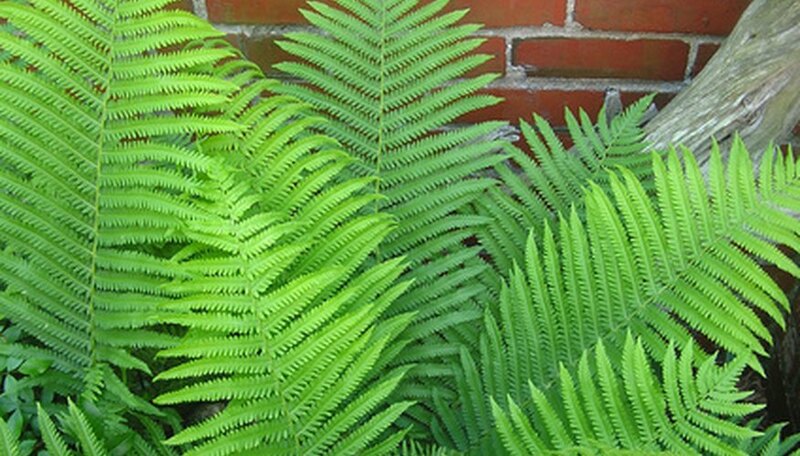 Avoid fertilizing your ferns for about six months after repotting them.